Neither stage lights nor costumes were needed on Tuesday for impromptu performances in Akron Children’s Hospital’s cafeteria and Perkins Square Park. Employees and hospital visitors enjoying lunch weren’t witnessing a flash mob per say, but many were wondering what was going on. To their surprise, a string quartet from the Akron Symphony Orchestra quickly set up their instruments as five dancers from Ohio Conservatory of Ballet suddenly appeared. Lively music composed in the mid to late 1800s – including Johannes Brahms’ Hungarian Dance No. 5 and Antonín Dvořák’s Slavonic Dance No. 8 – filled the air so the teens could interpret the cultural sounds through dance. 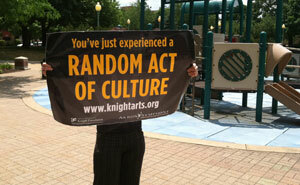 Knight Foundation organizes Random Acts of Culture programs in seven other U.S. communities where the brothers John S. and James L. Knight operated newspapers: Charlotte, N.C.; Detroit, Mich.; Macon, Ga.; Miami, Fla.; Philadelphia, Pa.; San Jose, Calif.; and St. Paul, Minn.
Last week a brass quintet from the Akron Symphony Orchestra stopped by to play Gioachino Rossini’s William Tell Overture, and another Act of Culture is expected at the hospital in the near future.